Most behavioral experiments out in the world are conducted by people with no university training. In 2016, bloggers at NerdyData estimated that A/B test company Optimizely’s software was deployed on over half a million websites. In 2017, the company announced that it had passed its one millionth experiment. Companies trying to support millions of behavioral studies aren’t waiting for universities to train socially conscious experimenters. Instead, training happens in hotel ballrooms at events like Opticon, which draws in over a thousand people every year, SearchEngineLand’s similarly sized SMX marketing conference series, and O’Reilly’s Strata conferences. And while scientists might consider experiments to be innocuous on their own, many have begun to wonder if the drive to optimize profits through mass behavioral experimentation may have damaging side effects. Traditionally, training on field experiments has primarily been offered to gradstudents, mostly through mentorship with an advisor, in small graduate seminars, or in classes like ICPSR’s field experiments summer course. Master’s programs in education, economics, and policy also have a history of classes on evaluation. These classes tend to focus on the statistics of experimentation or on the politics of government-directed research. So far, I’ve only found two other undergraduate field experiments classes: one by Esther Duflo in economics and Carolina Castilla’s class at Colgate. My class, SOC412, set out to introduce students to the actual work of doing experiments and also to give them opportunity to reflect, discuss, and write about the wider societal issues surrounding behavioral research at scale in today’s society. This 10-student seminar class was a prototype for a much larger lecture class I’m considering. The class also gave me an opportunity grow at teaching hybrid classes that combine statistics with critical reflection. In this post, I describe the class, imagine how it could be improved as a seminar, outline what might need to change for a larger lecture class, and what I learned. I will also include notes for anyone thinking about teaching a class like this. My goal for students was to introduce them to the process of conducting experiments in context of wider debates about the role of experiments in society. By the end of the class, students would have designed and conducted more than one field experiment and have a chance to write about how that experiment connects to these wider social issues. The class alternated between lecture/discussion sessions and lab-like sessions focused on methods. Assignments in the first part of the semester focused on the basics of experimentation, and a second part of the class focused more on developing a final project. You can see the syllabus here. In the first post about SOC412, I give more detail on the work I did to scaffold external factors. SOC412 also gave me a chance to test the idea that the software I’m developing with the team at CivilServant could reduce the overhead of planning and conducting meaningful experiments with communities. By dedicating some of CivilServant’s resources to the class and inviting our community partners to work with students after our research summit in January, I hoped that students would be able to complete a full research cycle in the course of the class. I think I did the right thing to offer students a chance to develop their own own unique research ideas beyond CivilServant. This added substantial time to my workload, but it allowed students to explore their own interests. I don’t think it will scale well. Never use Piazza again. The system steers conversations toward question-answer with the instructor rather than discussion, and the company data-mines student behavior and sells it to job recruiters (they make a big show about opt-in, but it’s an dark pattern default checkbox). I’m thinking about shifting to the open source tools Discourse and NB. Students conducted power analyses based on historical data, and difficulties with power analysis caused substantial delays on student projects. Develop standard software code for conducting power analyses for experiments with count variable outcomes, which can be reasonably run on student laptops before the heat death of the universe. Experiments are a multi-stage process where early planning errors can compound. The class needs a good way to handle ongoing documents that will be graded over time, and which may need to be directly adjusted by the instructor or TA for the project to continue. When using software to carry out experiment interventions, don’t expect that students will read the technical description of the system. Walk students through a worked example of an experiment carried out using that software. Since classes have hard deadlines that cannot easily be altered, do not support student research ideas that involve any new software development. Schedule meetings with research partners before the class starts and include a regular meeting time in the syllabus (Nyhan does something similar with an “X period”). If you want to offer students input, choose the meeting time at the beginning of the semester and stick to it. Otherwise, you will lose time to scheduling and projects will slip. Write a guide for students on the process of co-designing a research study, one that you run by research partners, that gives students a way to know where they are in the process, check off their progress, and communicate to the instructor where they are in the process. While it would be nice to allow students to form project teams based on the studies they are interested in, teams likely need to be formed and settled before students are in a position to imagine and develop final project ideas. Create a short guide, partly based on the Chicago Guide to Writing about Numbers, that shows a single finding well reported, poorly/accurately reported, and poorly/inaccurately reported. Talk through this example in class/lab. In the early part of the class, while waiting for results from their own first set of experiments, assign students to write results paragraphs from a series of example studies, referring to the guide. This class would not have been possible without the CivilServant nonprofit or Eric Pennington, CivilServant’s data architect. 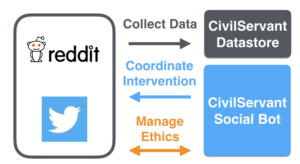 CivilServant provides software infrastructure for collecting data, conducting surveys, and carrying out randomized trials with online communities. The CivilServant nonprofit (which gained a legal status independent of MIT on April 1st, halfway through the semester) also provided research relationships for students. While gradstudents developed their own studies, undergraduate students used CivilServant software and depended on the nonprofit’s partner relationships. After the class, some students expressed regret that they didn’t end up doing research outside of the opportunities provided through CivilServant. During the semester, I developed several opportunities to conduct field experiments on the Princeton campus, and I explored further ideas with university administrators. Unfortunately, none of the fascinating student ideas or university leads were achievable within a semester (negotiating with university administrators takes time). Between the cost of the summit and staff time, CivilServant put substantial resources into the class. Was it worth the time and expense? When working with learners, our research couldn’t happen as quickly or efficiently as it might have otherwise. Yet student research also helped CivilServant better focus our software engineering priorities. Supporting the class also gave us a first taste at what it might be like to combine a faculty position with my public interest research. Next spring, we will need to plan well to ensure that CivilServant’s wider work isn’t put on hold to support the class. Should SOC 412 Be a Lecture or Seminar? Should You Teach a Class Like This? do you have the means to deploy multiple field experiments? do you have staff who can support community partnerships? do you have enough partners lined up? is your IRB responsive enough to make quick emendations during a semester? does your department already teach students the needed statistics prerequisites? do you have streamlined ways to conduct experiments that will work for learners? do you have Standard Operating Procedures for common study types, along with full code for the statistical methods? do you have the resources to continuously update any incomplete parts of student projects throughout the course to ensure the quality of projects?